Walk with ChaMike at Hotel JHill Myeongdong. 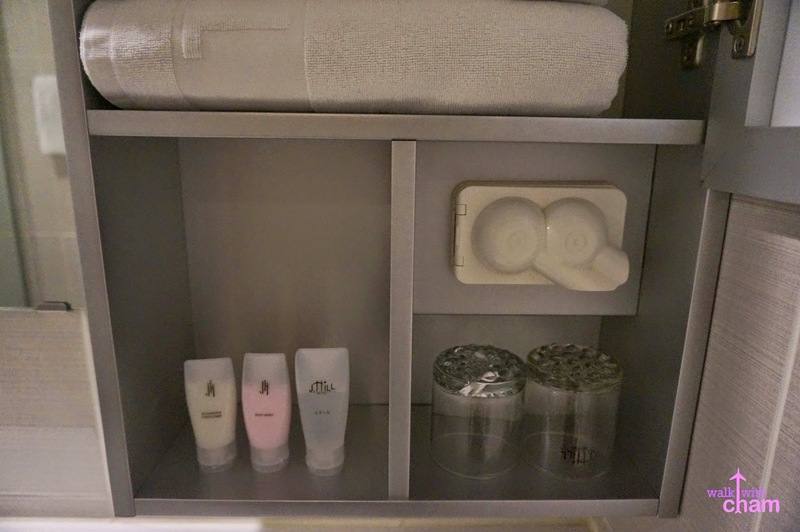 For my second visit in Seoul, I handpicked Hotel JHill mainly for its prime location. 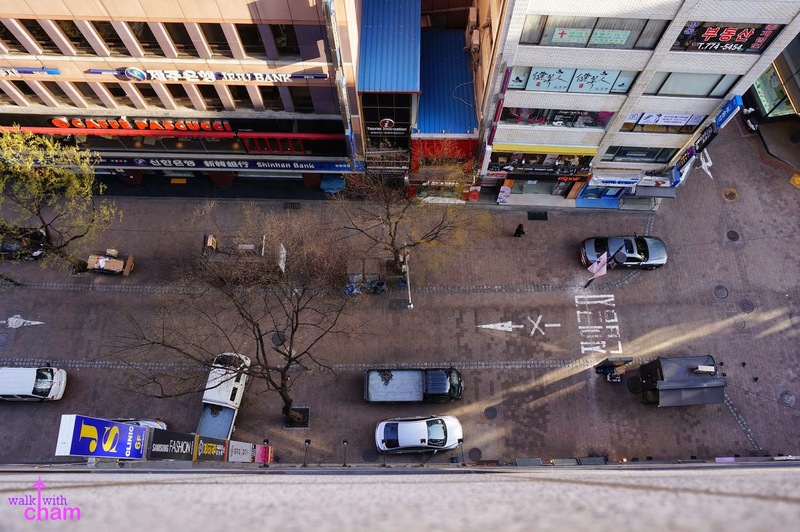 During my first trip I stayed at IP Boutique Hotel in Itaewon and this time I wanted a hotel in Myeongdong- the busiest, hip and happening place in Seoul. 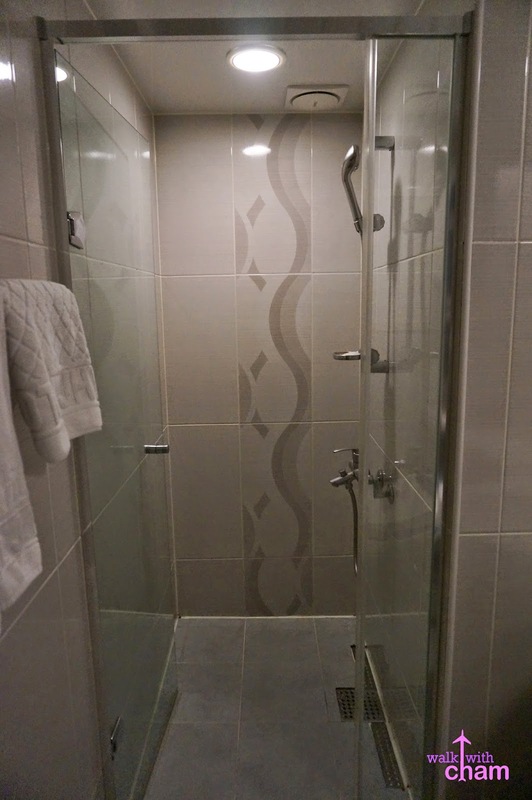 For years of traveling I learned that a good hotel is the key to an excellent traveling experience. A hotel that is located at the center of everything- shopping, restaurants, famous landmarks and especially subways/ transport hubs. And because I fell in love in Myeongdong the first time I visited the city I made sure that our hotel should be around the area. While looking through agoda.com Mike and I came across Hotel JHill and settled for it not just for the location but also for the price and of course the complimentary breakfast buffet. Just like in Hotel Ryumeikan in Tokyo, the lobby of this hotel is located at the very top of the building- 13th floor. After check in we then proceeded to our room. We were located at Room 1018 (coincidentally 18- our anniversary date). 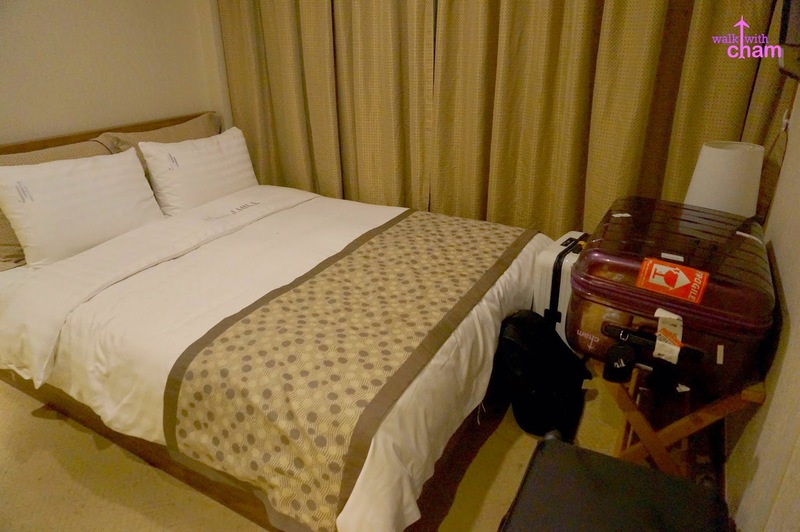 Though it was very small, the room was clean, had a comfy double bed and LCD TV with cable. 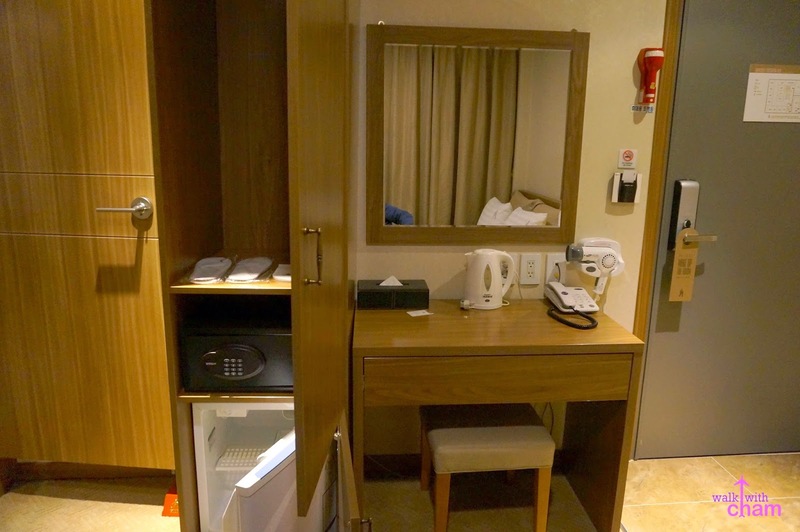 Opposite the bed was the closet, safe, mini ref, 2 complimentary bottled waters, slippers, study table, hair dryer, telephone, coffee and tea making facility. Every time I woke up I would take a glimpse outside. The view from our room was always refreshing in the morning. Sad I wasn't able to take a photo during busy nights because at night this quiet street transforms into a shopping mayhem. 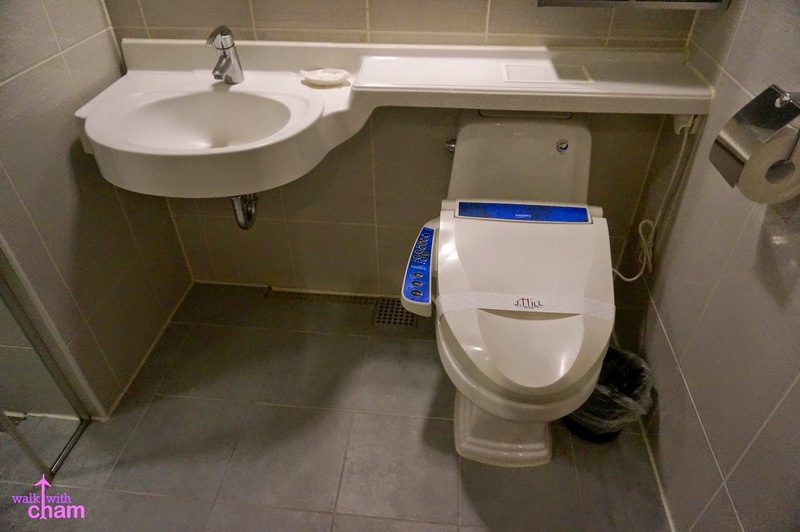 The bathroom was very minimal but clean. 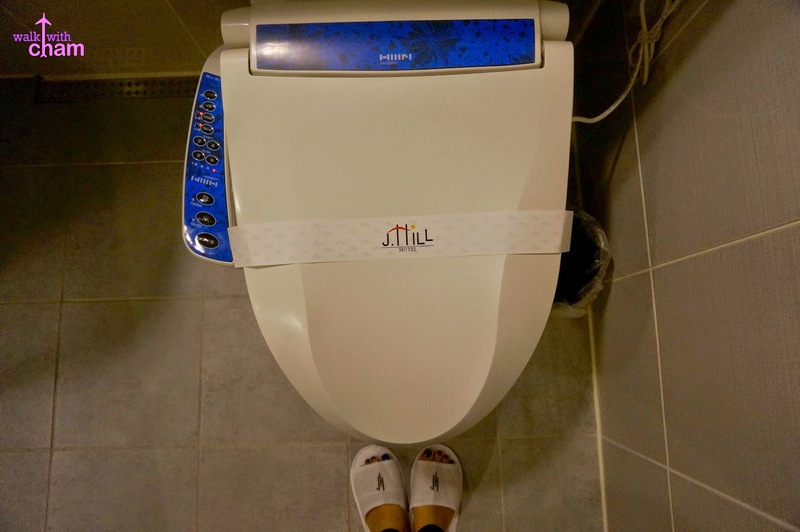 Loving the remote controlled bidets with heated seat. 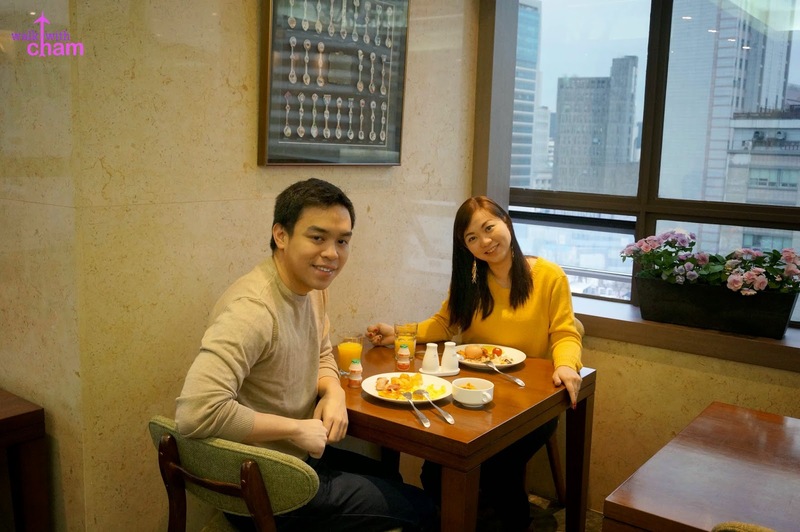 We find the breakfast choices to be always constant, there was no variety to the menu so we had to eat hash brown, eggs, nuggets, takoyaki, corn flakes & yakult for four straight mornings. I was already having an umay factor but that was not really big of a deal. Though I would suggest they try to reinvent their breakfast once in a while. 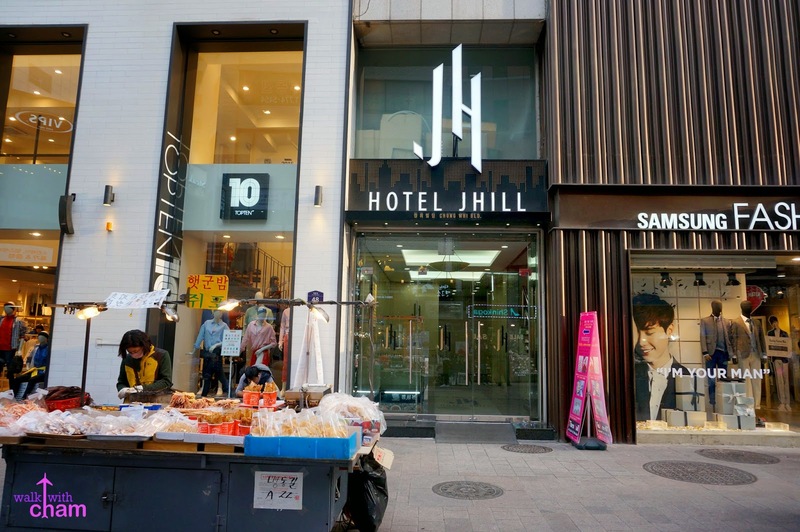 The hotel is strategically located at the heart of Myeongdong, it is in the middle of Top Ten Clothing Boutique and Samsung Fashion Boutique (When I saw the hotel's facade, I immediately recalled it from my last visit as I bought some items at Top Ten). 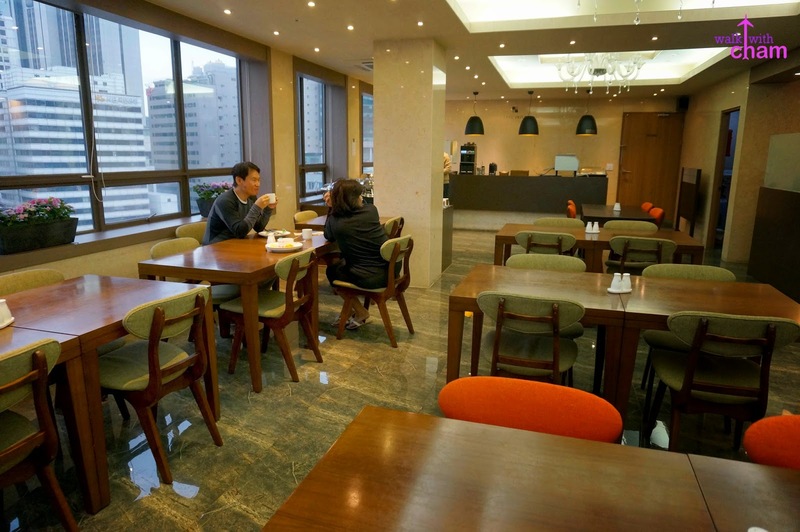 At the basement of our hotel is an authentic Korean restaurant which is quite good and cheap for its location. In front of our hotel was a tourist information office, money changer and numerous street food carts plus there are charcoal portrait artists for those of you who want to take home your very own face charcoal portrait. Along the streets are endless options of restaurants, beauty stores, retail brands and souvenir items. The only negative thing I found about this hotel was the staff. Compared to other hotel staff, they are not friendly and helpful. There were numerous times I asked several questions like the direction going to the cable car of N Seoul Tower (I heard it is just a walking distance from Myeongdong) but they told me there were none and instead told us to ride a City Bus. It cost us 12,000 won (P490) each for a round trip fare and took us a great deal of time to get back to our hotel compared to 6,300 won (P260) round trip cable car. I also asked them where to catch cherry blossom trees but they told me there were none as well (thank goodness I researched on that prior to going to Seoul). They were also not as polite as other hotel staff. There are two ways in going to Seoul/Myeongdong from Incheon Airport- via train or via limousine bus. We chose the latter because the bus will stop directly where Hotel JHill is located as compared to train that you should interchange several subway lines in order to reach Myeongdong. Given that we had 3 luggages changing lines was not advisable. Catch Limousine Bus 6015 at either exit 5B or exit 12A outside the arrival hall (1st floor) of Incheon Airport. One way ticket from airport to Myeongdong costs 10,000 won (P407). You can buy the ticket at any ticket booth inside the arrival hall or pay directly from the bus driver, if you chose to pay directly it should be in the exact amount. Bus arrives every 15 minutes. If you have big luggage it will be stored at the compartment and then you will be given a claim stub which you need to show to the driver when you arrive at your destination. Small luggages can be stored inside the bus. The bus has numerous stops. For Hotel JHill guests you should exit at Royal Hotel (Eulijiro 1-ga) tell the driver or press the red buzzer when you need to stop. Travel time is about 60-75 minutes. When you arrive at Limousine Bus Station of Euljiro 1-ga look for KEB Bank then walk towards Mos Burger then turn left until you reach Myeongdong Main street. Then you will see Hotel JHill for around 3-5 minutes. Same drill if you are going to the airport from the hotel. This time we paid 10,000 won directly to the driver. Make sure that you ride Limousine Bus 6015. Bus 6001 also stops there but the run time is farther and the fare is pricier. Hotel JHill was quite an experience. Because it is located in Myeongdong Mike and I had this nightly ritual of walking along the busy streets together with other locals and tourists until the stores closed. Time was not an issue as we were staying in the area. I would definitely book here again but will be wiser to ask the tourist information in front of the hotel instead of the hotel staff. Hi there, good writing about traveling to Korea. Here is more tips for you. You took a limousine Bus when you went to your hotel near Myeongdong, and here is other way to go to Seoul area. There is an express train connected to Seoul from ICN, this is the most comfortable and fastest way to go to Seoul area. If you take a express train, it takes 43 mins for going to Seoul station and you can get reserved seat. From 'travel center' in ICN(located in B1), you can purchase some good and reasonable transportation packages. There are 'express train and T-money card' , 'express train and international taxi(if you have many bags and people), and 'express train and EG sim card(phone card)'. Also you can get more information about traveling to Korea and transportaion with travel center staff so please visit to travel center. Thank you.